As much as I love the kind of arts and crafts where glitter and glue are involved, I have been looking for a different DIY project that my four-year-old can help me with over the Christmas holidays. My little one is obsessed with all things arts and crafts, unfortunately my stick figure drawings are just not impressing her like they use to. Belgium architect Thomas Hicks has come up with a stylish design for a lamp with a personalised twist. He designs it, you create it. 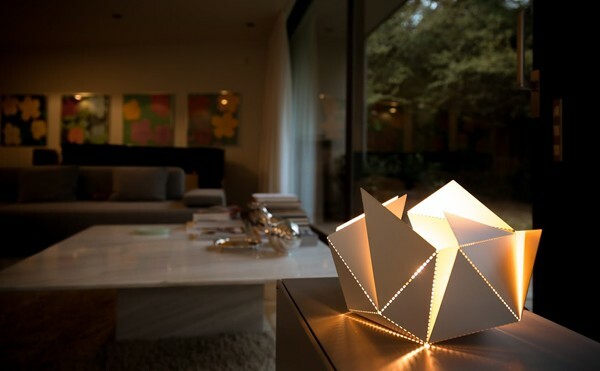 The folding lamp becomes an origami style sculpture. 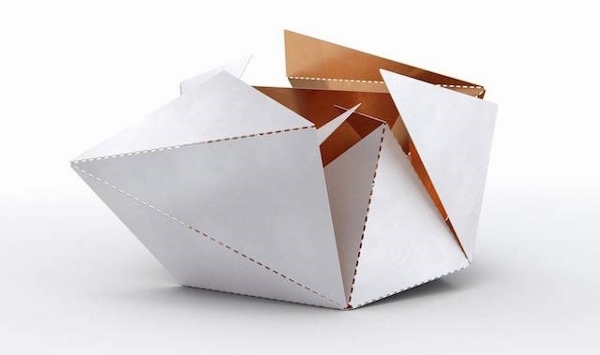 The idea is to start with a pre-dotted sheet of metal, fold it the way you want, deciding the order and angle of each fold (with the help of your little one), put a light bulb inside and you have designed your own lamp that looks as though it has come straight from the designer’s studio. The light shining through the folds and dotted lines will turn any room in the house into a luminous dream. Giving you a great recipe to light up your creative side and leaving you with a fancy lamp that you will be proud of, the lamp includes LEDs that can be dimmed and switched on and off with a gentle touch to any side. You can follow the instructions or let your creativity run wild, leaving your lamp with a unique and personal touch. The folding lamp is available in six colour combinations to suit your interior tastes, including matte black and gold, sanded matte white and red chilli, brilliant black and white pearl, matte white and copper, original or, my favourite, matte white and gold. The folding lamp is not yet available, but if you’re quick you can you can back it on Kickstarter to secure one of the first when production begins, prices starting at $165.